The following web resources may assist you in your search for a Summer Camp for your child. Ignoring yesterday’s snow fall and blustery wind, we’d like to think summer is just around the corner! Below you will find application information for camp financial assistance camp from both DDD and DCF. Please take note of the camps listed to the left, provided by our sister organizations, The Family Resource Network and Epilepsy Foundation of NJ. All are DDD qualified camps (DCF qualification pending). You can find more information about these camps at www.efnj.com/programs. The application forms for financial support toward summer camp tuition and one-to-one aide is now available. Applications will be accepted through April 30, 2014. The deadline for submitting requests for DDD camp funding is Monday, May 5th. *The link above will take you to DDD’s database of all qualified providers. To search for qualified camps, choose “Camp” from the provided list of Day Supports Services, then enter the city, county, or zip code you’d like to search in. It will take place on Saturday, March 29, 2014 from 9 A.M. – 12:30 P.M. in Newark. There is a safe parking area located on the site. 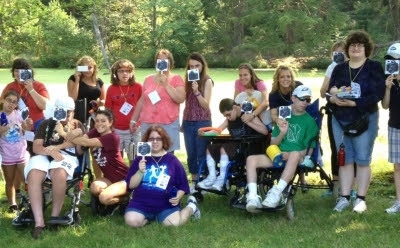 The Division of Developmental Disabilities (DDD), which serves individuals 21 years of age and older, is now accepting requests for assistance with payment for the 2014 summer camp session. Requests must be submitted to your loved one’s case manager or support coordinator by Monday, May 5. Below is an excerpt from DDD’s “Camp Services” informational document. “The Division of Developmental Disabilities’ (DDD) Family Support program may be able to offer some assistance with payment for camp. As with all DDD services, funding for camp is based on available resources. Families are encouraged to first seek assistance for paying with camp by contacting local town recreation departments and civic groups, such as the Elks, Shriners, etc. To review the whole document, which includes who is eligible for funding and the procedure on how to apply for camp assistance, please click here. Please note that children 20 years of age and younger are served by The Department of Children and Families (DCF). DCF will soon post its camp application for funding assistance. As soon as that application becomes available online The Family Advocacy Program will send a notice out. We welcome you to the next Bloomfield SEPAC Meeting, this Wednesday, March 19, 2014 at Watsessing Elementary School, from 7 – 9 P.M.
Montclair SEPAC 3-19-14, 7-9 P.M.
Wednesday, March 19th. 7 to 9PM at the George Inness Annex, 141 Park Street, Montclair, N.J.
Panelists and attendees will then break into smaller groups for Q and A. Join us at this important event; together we can gain insight on how to help our kids in an evermore stressful world. We look forward to seeing you there! Carrie Spindel Bashoff, PsyD is a clinical psychologist at the NYU Child Study Center who specializes in cognitive behavioral therapy and the treatment of anxiety and mood disorders. Peter Della Bella, M.D. is a Clinical Assistant Professor of Child and Adolescent Psychiatry at the NYU School of Medicine with private practice offices in Montclair and Manhattan. He has worked with children, adolescents, and adults cross- culturally, internationally, and within special populations. He has served as the Chief of Psychiatry and Medical Director for the YAI National Institute for People with Disabilities and has lectured widely within the medical community and the general public. He’s at www.dellabella.us. Ilyse Dobrow DiMarco, Ph.D. specializes in cognitive-behavioral therapy for adults. She is the Assistant Director of the Rutgers Anxiety Disorders Clinic and has a private practice in Millburn. Kevin Fried, Ph.D. is a clinical psychologist and psychoanalyst who works with children, teens and adults. He has a private practice in Montclair. He is a supervisor for students in the Rutgers Clinical Psychology program and the William Alanson White Institute of Psychiatry, Psychoanalysis and Psychology. He is also a consultant for Children’s Aid and Family Services and other agencies who provide services to children in the foster care system. David P. Steinke, Ph.D. is a State and Nationally Certified School Psychologist who utilizes cognitive behavioral techniques in both his school and private work. He has worked at Montclair High School for the past nine years. The George Inness Annex is across Park Street from Montclair High School. Parking is available in the lot behind the building, on North Fullerton Avenue just north of Chestnut Street. Meeting will be in Cafeteria/Atrium next to the parking lot. *Due to potential food allergies, we request that no food be brought into the child care room. Thank you!